COLORADO SPRINGS, Colo. -- Tens of thousands of children from around the world plan to call the North American Aerospace Defense Command to ask where Santa is -- and starting Saturday, they get a cheery answer about the mythical route from a real person, not a recording. The wildly popular NORAD Tracks Santa operation has launched its 61st run at Peterson Air Force Base, Colorado. Volunteers are answering phone calls and emails and post updates about Santa’s storybook world tour on Facebook and Twitter. On Saturday, posts gave a heads up to cities worldwide that Santa was on his way. Starting at 4 a.m. MST Christmas Eve, children can call a toll-free number, 877-446-6723 (877-Hi-NORAD) or email noradtracksantaoutlook.com to ask where Santa is on his fabled journey. Volunteers sit elbow-to-elbow in conference rooms at Peterson Air Force Base, NORAD’s home, answering phones and checking computer-generated maps projected onto big screens. First lady Michelle Obama traditionally answers calls via a remote hookup, but Noel said it was not yet known if she will participate again this year. Elsewhere at the Air Force base, volunteers update NORAD’s website, Facebook page and Twitter feed. Why does NORAD “track” Santa? It started in 1955 when a Colorado Springs newspaper ad invited children to call Santa Claus but accidentally listed the number for the hotline at the Continental Air Defense Command, NORAD’s predecessor. It’s now a tradition, beloved by kids and the military. 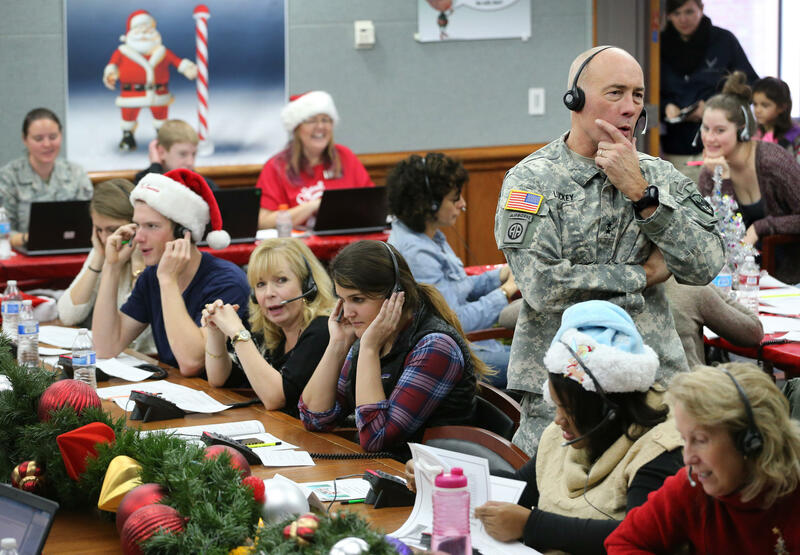 Volunteers range from generals and admirals to enlisted men and women, who sometimes report for telephone duty in military uniform and a Santa hat. The North American Aerospace Defense Command is a joint U.S.-Canada operation that defends the sky over both nations and monitors sea approaches. It’s best known for its Cold War-era control room deep inside Cheyenne Mountain - now used only as a backup - and for NORAD Tracks Santa.